Do you participate in a Profit Sharing Plan through your job? Are you looking to diversify your retirement assets by investing in physical gold and silver bullion? Then you came to the right place. Profit Sharing Plans come in a variety of forms, and are sometimes be used to compliment another type of retirement vehicle. While not often discussed with other predominant forms of defined contribution plans, Profit Sharing Plans are an important tax-advantaged benefit for many Americans. Here, we’ll go over what Profit Sharing Plans are, how they compare to other retirement plans like IRAs and 401(k)s, how precious metals investing works, and how you can safeguard your retirement assets against stock market or currency collapse. Employers set up Profit Sharing Plans as an additional form of employee compensation that allows them to share (through a trustee) company earnings with participating employees. If you have a Profit Sharing Plan account, your employer will make contributions to your account that are invested and can grow tax-free. Like many employer sponsored retirement plans, you will usually not be considered fully vested until several years into the plan. Unlike a Money Purchase Plan, where the percentage of annual earning that are contributed to plan accounts is predetermined, Profit Sharing Plan contributions are tied to your company’s profitability. Typical defined contribution plan restrictions apply: no withdrawals prior to 59 ½; early withdrawals come with a 10% penalty; distributions are taxed as personal income. Profit Sharing Plans money is usually placed into mutual funds, annuities (especially variable annuities), life insurance, or company stock. Only some plans, and under certain job conditions, allow for individual employees to direct the investments in their account. Only money that has been vested is ever eligible for a rollover, so be mindful of your vesting schedule before considering moving your retirement funds. The IRS will allow you to transfer your vested Profit Sharing Plan account funds, and requires that your plan’s administrator send you a written explanation of how to perform this tax-free. Gold stocks tend to be more risky than owning physical gold. This is because, historically, gold stocks will appreciate quickly when gold spot prices increase, but fall must faster than spot prices when gold declines. Cost of Production Risk – mining equipment depreciation, rising land values, labor cost increases, etc can all negatively impact a mining company's valuation. Fiat Currency Risk – when you sell securities like gold stock or shares of a gold mutual fund, you will still be paid in a fiat paper currency. In the even of currency collapse, you may be left holding worthless pieces of paper. 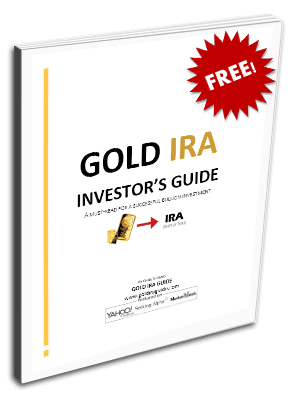 Gold investments are a simple, safe way to diversify your retirement portfolio. Gold — along with silver, platinum and palladium — will help to protect your assets against stock market volatility and inflation. Not only is gold a great hedge, but gold offers plenty of growth potential. In fact, many investors buy gold for its growth prospects, and many analysts predict gold to continue to see gains in the future.